But my goodness, the road to get there was a dull one. “Hostile” does so little to establish itself as its own chapter of this story it might as well have been 45 minutes of the cast literally treading water. Even the opening brawl that continued from last week’s stand-off felt anticlimactic, thanks mostly to some strange choices in camera work. We switched back and forth so frequently between awkward shots of the parents and kids watching Jonah and Karolina that I’m not entirely convinced the two groups were on set at the same time. From there, the episode is dragged down by some truly inconsistent writing from Quinton Peeples (who also penned the shaky “Refraction”). Too often scenes work to set up a payoff that either never comes or, worse, is immediately contradicted. Half the time, the results are funnier than they should be. After Karolina and Jonah’s bright-off, Nico makes a huge deal about going back for Karolina; she scolds Alex for not caring enough, makes bold no-friend-left-behind proclamations, and eventually runs off by herself. Nico then...immediately runs back, telling everyone to run away. It’s Han Solo coming back around the corner with none of the self-awareness. At this point, the most interesting tension on Runaways is between the talented young cast and the script. Nico might not be making much sense, but Lyrica Okano is putting enough fire into it that it comes just shy of working. Or look to the best scene of the episode, in which Gert gives her prehistoric pet (now officially named Old Lace) the old I-can’t-keep-you farewell. There is more believable emotion here between Ariela Barer and a velociraptor puppet than there was between Gert and Chase in “Doomsday.” But, again, the story cuts itself short; Old Lace returns before episode’s end, robbing the farewell of its impact for the sake of a cool final shot. Like most of Runaways’ first season—which had a huge problem handling anything close to a large-scale, coherent story—”Hostile” finds its bright spots in small moments. Molly finding a moment to act like a kid in the thrift shop. Gert apologizing for her anxiety in the middle of a stealth mission. Even Nico returning Karolina’s kiss—a romance that still doesn’t exactly feel earned—was a moving moment, if only because this show seemingly built on the idea of young friendship is severely lacking in moments of genuine warmth. 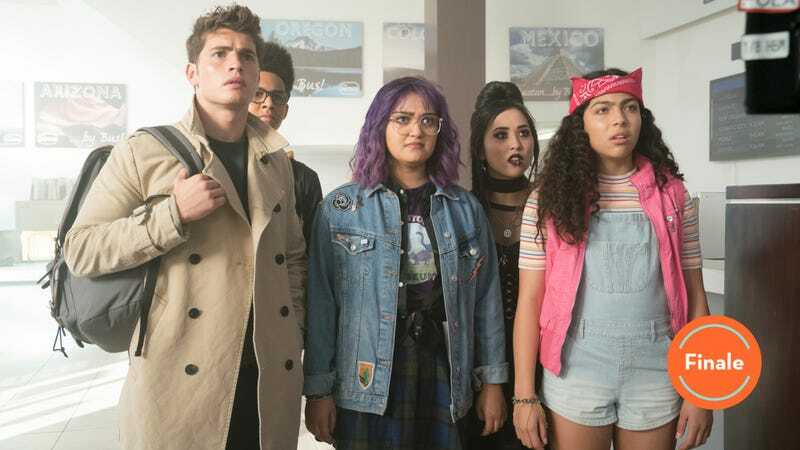 It’s interesting to note what all those moments have in common—they all focus on the kids, on that line between being young and having to fend for yourself, on the drama that comes with growing up—because it also serves as a list of the things Runaways was mostly missing over its first ten episodes. Disappointedly, they’re all also brief glimpses at a better show to come. I started off Runaways coverage with a Spider-Man comparison because, more than anyone, high-school misfit turned hero Peter Parker shares character DNA with his Marvel peers in Runaways. As the credits rolled on “Hostile,” I couldn’t help but imagine a series that took ten episodes for Peter to get bitten by a spider. Genuinely confused why Dale Yorkes just happened to be carrying a tranquilizer gun on him, especially because it appears to not even work. After turning the Wilders away from the Church of Gibborim, Jonah receives a text: “Mission accomplished. Let me know what’s next.” This could be the first sign that Runaways is going with a traitorous mole storyline. Whether the call is coming from inside Pride or the Runaways themselves is anyone’s guess but it’s interesting to note the background behind Jonah is oddly hazy, a possible sign of some flashback fuckery. The Big Reveal of the episode is that Amy Minoru was murdered by Jonah—and Leslie Dean knew the entire time—and it had nothing to do with Pride. This is...fine, as far as reveals go, but it doesn’t do much to justify Amy as a character in the first place. 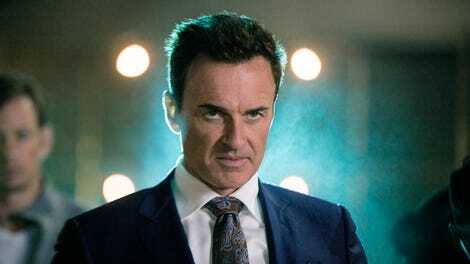 In general, Jonah as a villain isn’t doing Runaways any favors. He speaks primarily in mustache-twirls and cliche, and his motivation is still unclear. It’s hard to get fully invested in the stakes of a story when you still know nothing about the Big Bad after ten episodes. In a season filled with odd music cues, Francis and the Lights’ robotic, churning “Friends” playing under Nico and Karolina’s kiss might have been the strangest. Points for the “Lights” pun, I guess. The crew rescuing Karolina from the Church of Gibborim was a fun diversion that felt like it should have taken up much more time on a less crowded show. Nothing says “rushed” like the superstrong member of a team just breaking through a locked door. That said: hell yeah to Molly just breaking through a locked door. Not sure the Runaways continually mentioning how hard and weird it is to be around poor people—Nico in the thrift shop, Alex on Hollywood Boulevard—is the best way to make them endearing. If you enjoyed Runaways more than I did, that’s awesome! Life’s too short to argue about superheroes. Genuinely curious to hear all your thoughts on the first season.